OH: Your introduction to The Cambridge Companion to the Beats begins by taking on the immediate dilemma or paradox: that of presenting in a highly prestigious, highly conventional academic format, writers who have historically been marginalised by the academy and who often either embraced that marginalisation or didn’t care one way or another. Can you say a bit more about how you resolved or reframed this apparent contradiction between Beat content and Cambridge Companion form? SB: I fully recognize the broad irony in considering the Beats in a conventional academic format, but I also obviously find potential value in such treatment. So rather than pretend this irony doesn’t exist, I decided to lead with it as a way to motivate the introduction. I find the relationship between the Beats and the academy fascinating: in the late 1950s, you have this revulsion and dismissal by the academy and highbrow tastemakers, who called them juvenile, violent, and unliterary. Like any paternalist admonishment, this had the opposite effect of the one intended, drawing even more readers to the Beats as the media kept repeating variations of a story about scruffy pot smokers capable of little more than muttering Like, Man, and Wow out of the corners of their mouths. From the late 1950s, any academic consideration of the Beats had to contend with this reception as part of what made the writing culturally relevant. Given that, as a series, the Cambridge Companions often serve as first points of contact for students and others looking for scholarship on the topic, I thought it was important for my introduction to offer a sense of how the Beats have been packaged as a “generation” or “literary movement” from the 1950s on. To this end, I included a section called “An Introduction to Introductions,” which sketches a rough history of Beat criticism by looking at what editors wrote in their introductions to anthologies or collections of critical essays. I hope this not only acknowledges the previous critical efforts to which the volume is indebted, but also illustrates that however contentious it was and still is, one can locate a surprisingly symbiotic relationship between the Beats and the academy. Some of the chapters take up this relationship directly, particularly Nancy Grace’s “The Beats and Literary History: Myths and Realities,” which demonstrates, among other things, very specific ties between the Beats and the academy, and Hilary Holladay’s “Beat Writers and Criticism,” which takes another look at scholar Thomas Parkinson, whose A Casebook on the Beat was ground-breaking in 1961 and is still useful today. OH: Do you feel the actual book, as it materialised through its eighteen contributors’ chapters, delivered on your vision that the Beats’ hostility to academia was in truth more apparent than real? SB: I would be happy if the book points to the current vitality in Beat Studies, and encourages readers to pursue particular lines of critical inquiry in more depth. I think there is a lot of really wonderful energy in academic Beat Studies at the moment, in terms of critical studies like Hassan Melehy’s Kerouac: Language, Poetics, and Territory, which asks us to radically reconsider a central Beat figure, and in terms of the increasing availability of authoritative editions of primary works, letters, and previously unpublished writing—I’m thinking not only of your meticulous work but also of volumes like The Unknown Kerouac or Bill Morgan’s efforts in bringing us editions like The Best Minds of My Generation, a compilation of Ginsberg’s Naropa lectures on Beat lives and letters (itself a suggestive complication of the Beat-academy relationship). Add to this institutional recognition such as the EBSN, the Journal of Beat Studies, and the book series devoted to the Beats in the works at Clemson University Press, and I think it is fair to say that the open hostility to the Beats in academic circles has subsided greatly. For better or worse, just getting the Beats on Cambridge’s list is another act of incorporation of supposed rebel-outsiders into the academic fold. That said, I think there is much more work to be done before the Beats will have the same level of critical acceptance enjoyed by some of their contemporaries. OH: Was there anything in the coverage of the field that you would have liked to include in the Companion, any approach or topic that for some reason wasn’t there? SB: Pulling together a volume like this is a protracted series of negotiations between the editor, the press, and the contributors. I had an original vision for the volume that evolved as I worked through a proposal and responded to the sound advice of the press’s anonymous readers. A contributor or two dropped out along the way, and others wanted to change direction slightly from my initial conception. The final product is therefore a revised version of the original vision, and I think it is on balance better for it. One principle that guided my thinking from the start was to focus on texts rather than biographies, not because the lives are irrelevant or uninteresting, but because so much extant writing on the Beats focuses on juicy biographical vignettes to the exclusion of the texts themselves. While I’m as susceptible as anyone to the allure of outré exploits, and I recognize their role in the writing’s enduring appeal, I think that what will finally matter is the literature itself, and so I wanted to think about different ways to contextualize discussions of it. This is why I organized the book around historical and cultural contexts first, then moved in to a consideration of aesthetics to explore whether there is such a thing as an identifiably Beat novel or poem, given the wide variety of work such labels would name. Then I thought about some of the key themes or issues that critics have found particularly generative. For example, given the generally personal nature of Beat writing, it made sense to have chapters focusing on obvious markers of identity such as race, gender, sexuality, and religion, but also on postmodernism, transnational circulation, and the aesthetic resources of jazz. If total word count were no consideration at all, I could imagine focused analyses of a host of texts constituting Beat literature’s greatest hits—although what to include there would involve some equally protracted calculus. I also would have liked to have seen the bounds of “the Beat” explored further. The book tends to focus on work written from the late 1940s to the early 1960s, but if you consider Beatness more expansively, as a diffuse literary movement (as I do), then there is much more to think about in the 1970s, 1980s, and beyond. Although we were able to gesture and at times refer to such work, precisely because it is a circumscribed entry in a fairly well-known series, there is a basic amount of orientation that needs to happen. OH: Your book is defined by the Beat field, but in the latest issue of the Journal of Beat Studies, you make an interesting distinction when reviewing Erik Mortenson’s recent book, Ambiguous Borderlands: Shadow Imagery in Cold War American Culture (also reviewed on this website, by Rona Cran). You rightly observed a telling difference between that book and his first, Capturing the Beat Moment (2010): that is, between studies that work within the field’s definition of itself and those that integrate the Beats within a larger cultural history. Can you say more about the pros and cons of these distinct approaches? SB: Well, of course the nature of the Cambridge Companion series is to focus inquiry on a particular author, or else on a topic such as Modernism or the Harlem Renaissance, the limits of which may ultimately be arbitrary and imposed from the outside. That said, I’ve long been interested in the ways literary critics frame or categorize periods or movements to make them intelligible—I believe that there is utility in so doing, so long as one remains self-reflexive about the vexed nature of categories, that they can obscure as much as they illuminate. I began my scholarly life thinking about Cold War literary and cultural studies, and my first book explored the nature of “Cold War literature”—which may seem at first blush work like Advise and Consent that takes politics head on. In fact, work in that field is often precisely that which does not seem political at all. Ambiguous Borderlands was thus interesting to me as a book framed in terms of Cold War studies by a scholar who had made his name in Beat Studies. Of course a larger figuration such as “post-1945” or maybe “contemporary literature” encompasses these overlapping subfields, but his book confirmed for me the importance of audience when doing academic writing. 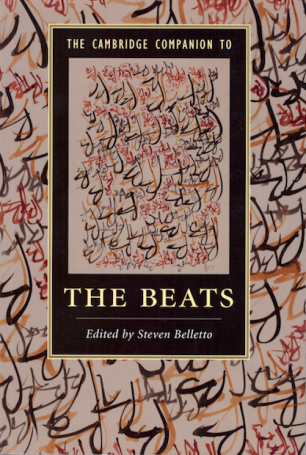 Something called Beat Studies is comparatively small but deep, by which I mean those invested in Beat Studies know a lot about the topic and thus suppose a kind of baseline knowledge that ought to be assumed rather than repeated. While this is true of any discipline or speciality, I do think it is especially acute in Beat Studies, which is haunted by that long history of critical dismissal. A certain amount of wagon circling is thus probably inevitable. I think we see this with R.J. Ellis’s reaction to The Cambridge Companion to the Beats, which faults what he calls the book’s “broad-brush sweeping surveys.” For Ellis, the volume’s chapters tend not to be granular enough to present “striking(ly) new research.” I understand this reaction since it is born from Ellis’s unusually deep knowledge of the Beats—it is true enough that the book is probably not “striking(ly) new” to someone who has written a book on Kerouac. But I was more interested in a wider audience, one composed of smart and informed readers perhaps less steeped in Beat minutiae. Hence chapters are broadly ambitious, making bold claims in terms of genre or periodization that I hope will help readers get a handle on the primary and secondary literatures. I tried to make the book a point of departure, which is why the Chronology runs to 16 pages and is likely more expansive than casual readers of Beat literature would expect. In my own chapter, “Five Ways of Being Beat, Circa 1958-59,” I wanted to draw some attention to less frequently discussed figures, so while Ellis and other experts are of course familiar with Tuli Kupferberg or Lenore Kandel or Jack Micheline, others may be less so, including students and non-professionals, as well as scholars on the outside of Beat Studies as such. And while my brief analyses may seem straightforward insofar as they hew to the broad contours of these writers’ works, I went out of my way to engage and cite at least some texts that, to my knowledge, have never been mentioned in scholarship on the Beats, including Kupferberg’s book of poetry, Snow Job, and his short critical text, Beating, as well as Lenore Kandel’s chapbooks A Passing Dragon and An Exquisite Navel. OH: Finally, in terms of your own work, how does The Cambridge Companion to the Beats fit into where you’ve come from and where you’re going next? SB: As I’ve mentioned, I have done some work in Cold War literary and cultural studies, but I’ve also had a long-standing interest in the Beats. For instance, in the Coda of my first book, No Accident, Comrade, I discussed Kerouac in terms of how “spontaneous bop prosody” might be considered “political” according to the norms of the Cold War frame. As I was working on The Cambridge Companion to the Beats and on another collection that will be out in the coming months, American Literature in Transition, 1950-1960, it occurred to me that there might be some interest in a synthetic and comprehensive literary history of the Beats that begins with the inner circle but radiates out to explore the wider literary movement. That’s what I’m working on now: a literary history of the Beats that explores how the meaning of “Beat” or “Beat Generation” can only be located in a complex, interlocking set of definitions offered by the writers themselves, by the popular media, and by the academy. Following from my previous work on Cold War literature, it may not be surprising that I read Beat writing as fundamentally political, especially if we consider the breakdown between the public and the private spheres they encouraged. This book makes the case, in a variety of contexts and through analyses of a wide array of texts, that the Beats set the stage for this breakdown throughout the 1940s in ways that anticipated and framed the ascendancy of countercultural voices in the 1950s through the 1970s. In the course of so doing, I try to offer my own spin on familiar texts like Kerouac’s On the Road or Corso’s “Bomb” while also taking seriously other voices who have claims on generating Beatness rather than merely responding to it.